We'd all do well to re-read this document to review the origin and design of government, its context in relation to the English monarchy and hereditary succession, thoughts on present day American affairs, and our abilities to face challenges as a nation. Or those whom choice and common good ordain. [P.S. The Publication of this new Edition hath been delayed, with a View of taking notice (had it been necessary) of any Attempt to refute the Doctrine of Independance: As no Answer hath yet appeared, it is now presumed that none will, the Time needful for getting such a Performance ready for the Public being considerably past. OF THE PRESENT ABILITY OF AMERICA, WITH SOME MISCELLANEOUS REFLEXIONS. 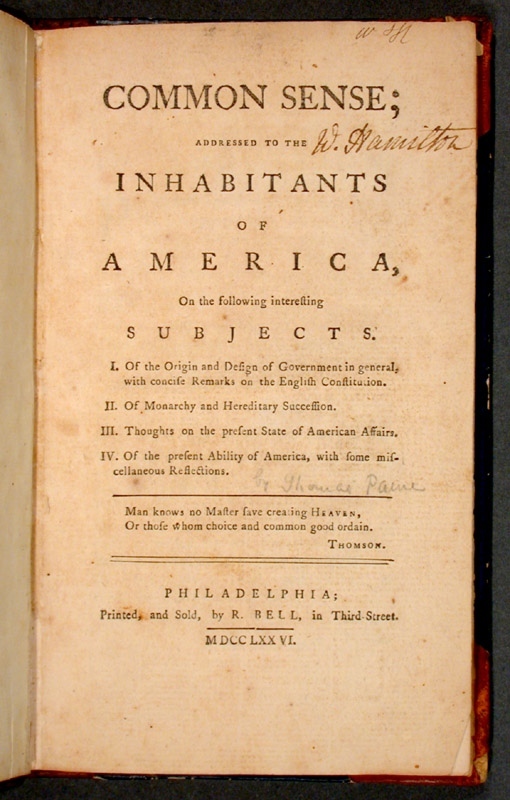 Return to the Thomas Paine library.